What is FADING, Its Type and Effect in RF design, phenomenon is due to multipath propagation, fading, signal, received signal strength, rayleigh fading. 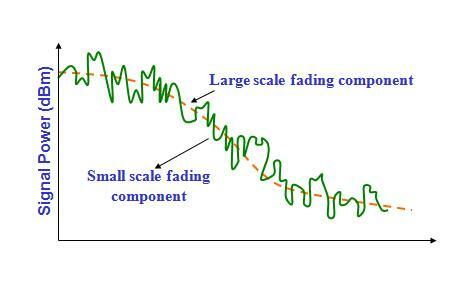 Fading is most important thing when you design any RF Design lets understand what is fading and how its effect. The communication between the base station and mobile station in mobile systems is mostly non-LOS. The LOS path between the transmitter and the receiver is affected by terrain and obstructed by buildings and other objects. The mobile station is also moving in different directions at different speeds. The RF signal from the transmitter is scattered by reflection and diffraction and reaches the receiver through many non-LOS paths. This non-LOS path causes long-term and short term fluctuations in the form of log-normal fading and rayleigh and rician fading, which degrades the performance of the RF channel. Terrain configuration & man made environment causes long-term fading. Due to various shadowing and terrain effects the signal level measured on a circle around base station shows some random fluctuations around the mean value of received signal strength. The long-term fades in signal strength, r, caused by the terrain configuration and man made environments form a log-normal distribution, i.e the mean received signal strength, r, varies log-normally in dB if the signal strength is measured over a distance of at least 40l. Experimentally it has been determined that the standard deviation, s, of the mean received signal strength, r, lies between 8 to 12 dB with the higher s generally found in large urban areas. This phenomenon is due to multipath propagation of the signal. The Rayleigh fading is applicable to obstructed propagation paths. All the signals are NLOS signals and there is no dominant direct path. Signals from all paths have comparable signal strengths. The instantaneous received power seen by a moving antenna becomes a random variable depending on the location of the antenna. In this case there is a partially scattered field. 26 queries in 0.328 seconds.